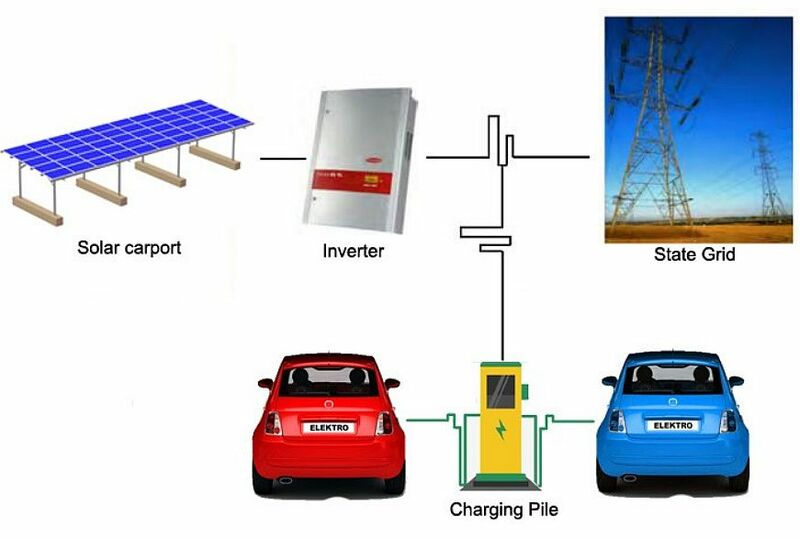 A state-wide network of Electric Vehicle Charge stations using standardized containers is proposed in this paper (pdf). Container-based Electric Vehicle charge stations can provide self-funded, neighborhood-based, power and broadband communications. Charge stations and community wireless provide resiliency and revenue. (1) Plan for an energy future with the lowest emissions. (2) Provide for resilient communications after the expected earthquake. Container buildings have grown in popularity. They are strong, cheap, and easily moved. Whole Container Cities have been created. Communications after a subduction zone earthquake may be nearly impossible. Solar-powered wireless (with satellite backhaul) can be faster and cheaper than cellular. Everything in one container. Easily shipped. No installation. Self-contained. Self-supporting. Charge stations make electric transit practical in both rural and urban neighborhoods. They can also provide resilient communications and a self-sustaining revenue source. Bird sells scooters to entrepreneurs at cost, then takes a 20 percent cut from the ride revenue. Solar pays for itself in 7-10 years. But with a shared electric car or scooter, the whole thing might be paid off in 3 years. Shared electric vehicles could generate $300-$600 per month. Combined with a solar powered charge station, these units could provide community resiliency…and broadband communications. An investment in a solar array may take 8-10 years to pay back when electricity is sold back to the power company at wholesale rates. But revenue from an EV charge station would increase income dramatically. A (shared) electric car can also act as a community battery. Partners like bike/car sharing benefit as well. Using 4 hours of full sun each day, a 6kWh solar array x 4 hours would generate an average of 24 kWhs per day. Times 30 days, that’s about 750 kWhrs per month. At 10 cents per kWhr, that’s only $75 a month income/credit. The average solar system payback time in Oregon can be 7-10 years (after incentives) on a 6kW system. Solar’s cost, currently around $1 per watt, continues to decline despite Chinese tariffs. Oregon’s Residential Energy Tax Credit (RETC), sunset at the end of the 2017, and cut the cost of a typical rooftop system by as much as $6,000, but it’s being offset by cheaper, more efficient panels. 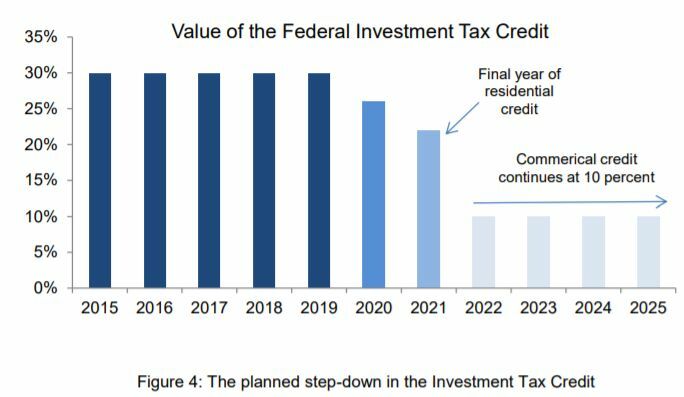 The Federal Investment Tax Credit allows you to deduct 30 percent of the cost of installing a solar energy system from your federal taxes, with 2019 the last year when you get a full 30%. It gets reduced to just 10% in 2022 for commercial installations. A self-funding, resilient network, may require more income to attract investors. That’s the basis for this proposal. We believe an Electric Vehicle charge station, a broadband wireless hub, a coffee shop or a car/bike share businesses like Lyft and Uber could generate revenue and save everyone money. Mapdwell is the most advanced rooftop-solar mapping tool available, showing the solar potential for all Portlanders in cooperation with Energy Trust. Net Zero buildings run 100 percent on renewable energy. Resilient Cities can adapt and transform after disasters. DISCLAIMER: Whenever possible, actual products and services are linked, although this paper does not recommend specific technologies. This paper overviews current options, with rapid marketplace change expected. Oregon is one of 22 states in the US Climate Alliance. Oregon Lawmakers plan to curb carbon emissions with the 2019 Clean Energy Jobs bill. In 2016, Oregon’s Legislature passed a landmark energy bill, called the Oregon Clean Electricity and Coal Transition Plan to provide 25 percent of renewable electricity by 2025. Oregon’s renewable standard will require 50 percent of customer’s electricity to be from renewable resources by 2040, using cap-and-trade to reduce the state’s greenhouse gas emissions. The Tradable Instruments for Global Renewables (TIGR) is an online platform for tracking and trading Renewable Energy Certificates (RECs). The 2019 Leaf+ features 200 mile range, 100 kW charging, and Vehicle 2 Grid. The car can act as a community battery. Nissan’s No Charge to Charge program provides free 30-minute DC Fast charges and 60-minute Level 2 charges for 24 months. A 12-kwh lithium-ion battery pack on the Mitsubishi Outlander PHEV is the only plug-in hybrid with a CHAdeMO quick-charge port that can act as a community battery. The 2019 Outlander PHEV goes about 25 miles on its battery before the car switches to gas. The competitive landscape for $35,000 electric cars includes the 2019 Leaf Plus, (226 miles), Chevrolet Bolt (238 miles), Hyundai Kona (258 miles), Kia Niro (239 miles) and Tesla Model 3 (220 miles). Low or moderate income Oregon residents are eligible for rebates of $2,500 on used electric vehicles (EVs) and $5,000 on a new EV, from the state. That way, money from fuel (electricity) made in the state, stays in the state. The transition to electrified transportation is accelerating rapidly, with half of 2040 car sales expected to be electric. ChargePoint, the nation’s largest charging network, has around 60,000 charging spots in 43 states, but only about 1,000 are Level 3 (Fast Charging, in 30 minutes or so). The EVgo network has more than 1,100 public fast chargers running in 66 metropolitan areas across the U.S., while Electrify America, is planning to install more than 2,000 DC Fast Chargers at nearly 500 sites across 40 states. Many Level 2 chargers are free to use, but you’ll have to pay for Fast Level 3 charging. JuiceNet predicts when EV owners will charge their vehicles, enabling the utility to adjust demand/response. That’s going to be a necessity when EV penetration grows above 20%, in just a couple of years. 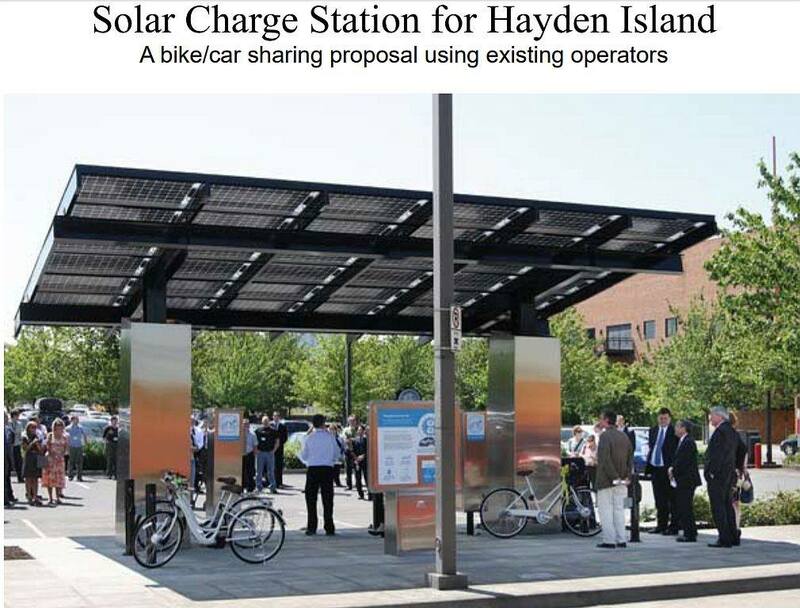 A public fast charging station not only opens up the market to apartment/condo dwellers (such as those on Hayden Island), it can also make money. Maybe $10 per 20 kW fillup, generating $1000 per month. EV Connect is the leading provider of open standards-based EV charging software. The Chargeway app works with PGE’s Electric Avenue and allows EV owners to manage accounts from multiple providers. The city, state or county could even pocket a few cents off the top for road maintenance. Currently, the federal government takes 18 cents a gallon for gas, which provides 85 percent of the Highway Trust Fund. The West Coast Green Highway stretches the 1,350 mile length of Interstate 5, through Washington, Oregon, and California with public charging stations for electric vehicles. The fast charge technology allows drivers to re-charge vehicles like the Nissan Leaf in under 30 minutes. Each location also includes Level 2 equipment to re-charge most plug in electric vehicles in 4 hours or so. The West Coast Clean Transit Corridor Initiative will explore how best to provide EV charging on Interstate 5 for heavy-duty electric trucks. The “fast-charging” stations could cost between $15,000 and $90,000 each, providing up to one megawatt of power. Many inexpensive shipping containers are ten or twenty feet long and 8 feet high. The OffGridBox is a 6’x6’x6’ steel container, with 12 solar panels (3.36kw), 15 kWh of battery storage and a water purification system. The OffGridBox costs about $15,000 and comes with a BuyBack Program. Eight, SunPower 400 watt panels (made in Hillsboro) should produce 3.2 kWatts or an average of about 12 KWatt/hours per day. That may top off an older Leaf electric car. A 3 kW system costs about $3/Watt ($9K), less 30% federal tax credit, or $6K. A used EV might cost another $5K-$10k. A Community PrepHub could supplement the containers’ self-sustaining electric and communications gear, providing water, hand-held radios, first aid supplies, and other post-earthquake resources. 1. Electric Vehicle charge stations fit in one 20 ft container. It utilizes 6 KW of solar, battery storage, and Level 2 or Fast Charging for EVs. Resilient. Cheap. Federal tax credits pay up to 30 percent of the cost. The SolarEdge Single Phase Inverter ($1300) combines 2 power sources (PV and grid) for faster car charging at less cost. 2. Community Broadband Radio Service (CBRS) spectrum provides community broadband for a radius of 1-5 miles using 3.5 GHz — available on phones this year. One 20 ft container, with a utility pole mast, delivers communications resiliency. Shared spectrum at 3.5 GHz is the law. CBRS Release 3 supports 5G in the shared 3.5 GHz band. How fast is CBRS? A single 20 MHz channel can deliver 400 Mbps. Using 4×4 MIMO, with a total bandwidth of 60 MHz, a client device that supports two or three streams would easily top 1 Gbps or more. Far cheaper than fiber to the home…and mobile. CellCos plan to use “free” 3.5 GHz spectrum for “5G” but will utilize Licensed Assisted Access (LAA) which REQUIRES users to pay for regular cellular service. MuLTEfire is more like WiFi. You don’t have to be a cellular subscriber. The FCC is providing $67 million through the Connect America Fund to expand service in rural areas. Samsung’s 5G Massive-MIMO base station uses the 3.5GHz spectrum and supports both legacy 4G networks and next generation 5G. 3. Bike/scooter sharing, funded by Uber or Lyft (Motivate), could be housed at the Hub. Bikes and scooters can be tracked with the wireless link. A coffee shop or bike share provides additional revenue…and Last Mile transportation. 4. 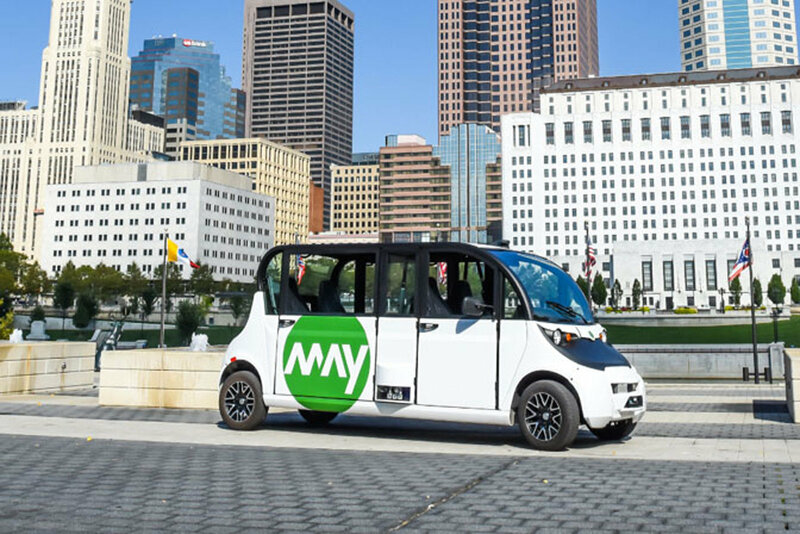 Electric transit could save thousands every month. On demand or scheduled. Why burn money up? A McKinsey analysis found shared “seamless” mobility could accommodate 30% more traffic while cutting travel time by 10% by 2030. Lyft will allow drivers to rent electric vehicles using their Green Mode. If there’s a need to track things, a LoRa device, using the unlicensed 900 MHz band, like a $50 Micro Tracker can track people and things at virtually no cost (without cellular fees). If grid power is lost or unavailable, solar power kicks in. A single 13.5 kWatt/hr Tesla Powerwall can supply 500 watts X 20 hrs or 10 kWatt/hrs. That’s our working power budget. No A/C, 150 watts for satellite, 250w for CBRS, 100w for lights. Is it stingy? Yes. An 8′ X 10′ container roof can support about ten, 350 Watt panels. Twenty, 350 Watt panels produce up to 7kW in a 14′ X 16′ space. Over 8 hrs, that’s up to 56 kWatt/hours. Vehicle to Grid, in a 60 KW/hr Nissan Leaf, can use the car’s battery to provide power in an emergency. The car is the emergency battery. Leaf’s CHAdeMO fast charging remains easier to find than CCS (Combo) used in other long-range hatchbacks like the Chevy Bolt EV or Hyundai Kona Electric. An electric car might eliminate the need for batteries in the container. Electric cars provide more battery capacity, more flexibly, and they’re relatively cheap. A used Leaf costs $5,000-$10,000. If you dedicate 30kW/hrs of a 60 kW/hr car battery to running a building, that’s 10 hours at 3k Watts per hour. A used 30kW/hr Nissan Leaf ($10,000) would provide twice the power of a 13kW/hr Tesla Powerwall ($7,500) AND could be rented through Turo, generating $330/month income and paying itself off in 3 years. No gas. Arcimoto has a $12,000 three-wheeled electric vehicle. How does it work? The solar array feeds smart inverters from Solar Edge or Ideal Power to combine sun and grid power for Level 2 EV charging (6kW-10kW). A grid-tied Fast Charger provides 30 minute DC charging (60kW-100kW). Hitachi’s V2X Charger and Princeton Power Systems provide bi-directional charging that can recharge a car or put that energy back in the building or grid. Honda will include V2G in its new electic vehicles as well as inexpensive (Level 2) EV chargers (see below). When the building produces more solar power than it needs, the surplus is stored in the car battery. The stored energy can then be discharged back into the grid and make some money. Nissan Energy Share continuously monitors a building’s electrical loads, looking for opportunities to periodically draw on the LEAF’s battery. A vehicle with a 200-mile range using a 60kW battery could run a typical house, including air conditioning, for two to three days. With 4 hours of good sunlight daily, a 15 KWatt solar array might deliver 60kW hours back into the car’s battery. An Air Force Base is testing V2G in a 34-vehicle fleet with a total battery capacity of 996 kWh. That’s power for driving, utility buy-back, or for emergencies. Self-contained charge stations, located near community centers and apartments, could provide charge stations where not otherwise available and provide community emergency power. A free benefit. Rent the car. A Nissan LEAF e+, hooked to a 100 kW charger, can fill-up in about 30 minutes. The Tesla Network will “enable your car to make money for you when you aren’t using it.” The car’s default key is a phone app which connects to the car with bluetooth and unlocks when you walk near with a paired phone. This enables temporary keys to be sent out to people who rent the vehicle. Broadband everywhere in the State of Oregon is a key benefit of this self-funding approach. Citizens Broadband Radio Service (CBRS) is a new 150 MHz wide band, centered around 3.5 GHz. It’s like WiFi (free spectrum), but uses LTE or 5G for voice and data. Works on phones. CBRS 5G deployment is expected in 2020. Stand-alone 5G in the unlicensed band is the follow-on to MuLTEfire’s LTE, and becoming part of the 3GPP standard. Municipal fiber would cost consumers 2-5 times more for the same 100 Mbps–1 Gbps performance…with no mobile access. It’s basic economics. Wireless is more affordable than fiber. Digital equity manifest. Sprint’s 1 Gbps LTE uses 2-3 channels (40-60 GHz total bandwidth in their 2.5 GHz band). The initial broadband wireless service would utilize a cloud-managed WiFi hotspot, 5G Hub or Sprint’s 5G hotspot which is actually a 4G “relay”. T-Mobile claims it would deliver “100-Mbits” to two thirds of the US if it merges with Sprint. The current 150 MHz-wide, 3.5 GHz band has lots of spectrum. Plug & Play. Shared spectrum, shared radios, shared infrastructure. Lower cost. Australia auctioned off their 3.5 GHz spectrum for 5G. The USA provides it free. Motorola’s MOTOTRBO Nitro uses the 3.5 Ghz (CBRS) band for LTE voice and data. They run it, you manage it (with a tablet). Motorola’s SLN 1000 walkie talkie is the first CBRS handheld radio. But CBRS will be included in many smart phones in a year or two. Just like Wi-Fi. Get a hockey puck or phone. Done. No trenching. No truck roll. Free WiFi-6, also provided in the hub, enables up to 74 clients to connect to a single AP. We’re focused on off-the-shelf CBRS gear. Phones like Pixel, Motorola and Essential already have 3.5 GHz built-in, with 3.5 GHz mobile hotspots available soon. The Galaxy S10 has full support for CBRS (band 48) across the product line. Some 400 megahertz of mid-band spectrum may be available – nearly the combined capacity of the top three carriers. Google’s Spectrum Access System (SAS) costs $2.25 per residence per month, but it only applies to fixed wireless. Shared spectrum CBRS gear may run $5-$10K, compared to traditional gear on towers which can cost $150K. A 2 year return on investment is expected from RuralStar Lite, a traditional $20K licensed rural cellular solution that uses satellite backhaul. Satellites work when cellular is down. High throughput satellites today provide cheaper broadband than any cellular plan. Viasat is working with Facebook for Community WiFi. ViaSat’s business hotspot services can manage WiFi hotspots and brand your Wi-Fi splash page using their satellite business internet for backhaul. Done. Hughes was awarded $28.3 million to bring satellite broadband to 72,163 locations across New York. Of the $28.3 million, $14.8 million comes from the New York program, and the rest comes from the FCC’s CAF program.Viasat won $122.5 million in free government (CAF-II) funding for Rural Broadband. ViaSat is providing Community Broadband thoughout Mexico. The State of Oregon could do the same. U.S. satellite broadband providers Hughes Jupiter-2 (97 West) and ViaSat-2 (70 West) both have massive new geostationary satellites launching in 2020. Hughes Jupiter-3 will deliver half a terabit per second while ViaSat-3 expects to deliver around 1 Terabits/sec. But geosynch satellites are designed to operate for 15 years, making the platforms obsolete and ineffective within a few years, notes SpaceNews. Proposed new LEO internet satellites such as OneWeb, SpaceX Starlink and Telesat all plan LEO broadband constellations starting in 2020. The 331-pound OneWeb satellites are designed “to provide internet to everybody, everywhere” and be deployed in a constellation orbiting at 745 miles. Instead of one, $250 million satellite, OneWeb plans hundreds of satellites in Low Earth Orbit with lower latency. The SpaceX Starlink would have thousands of satellites at various heights with the best coverage at latitudes between 47° and 52°, north and south. Cheap electronically steered flat panels are the key breakthrough here. ALCAN, Isotropic and Viasat have $200-$500 flat panel antennas. Kymeta, Phasor and ThinKom are pricier. SES’ O3B has a MEO orbit. An SES fleet of seven “super-powered” mPOWER Medium Earth Orbit is also scheduled to launch in 2021. O3b mPower has triple the capacity of the ViaSat-3 constellation with a spot beam delivering up to 10 Gigabits to one terminal. Latency like fiber. These LEO and MEOs will compete with today’s GEO-based ViaSat and HughesNet. Figure several hundred dollars per month for 100-200 Mbps satellite service to the hub. Tarana Wireless and Echostar plan a Gigabit “last mile” meshed access system. Broadband satellite backhaul should be fully operational in 2021. By that time both 3.5 GHz basestations and phones are also expected to reach the mass market, saving marketing expenses. Geosynch satellite have latencies of 600ms or more, while OneWeb has latencies around 30ms, just a bit higher than a typical cable system. A Cloud-RAN typically needs latencies around 75ms. Could satellite replace fiber to the tower? Maybe. MobiledgeX brings the cloud computing basestation to the tower and will be supported by Release 16, due next year. In 2021, we plan to plug the 3.5 GHz basestation into OneWeb’s low-latency, high-speed satellite backbone. Cellular service not required. It’s Community Broadband. If LEO satellite proves impractical for a direct link to the neighborhood hub, then we may use an EdgeMicro data center in a shipping container on a hilltop location like the Stonehenge Tower on Council Crest. The hilltop container connects to the internet through 10 Gbps fiber or 1 Gbps MEO satellite (backup) and connects to the local wireless hubs via microwave. That approach provides a regional “software basestation” that controls a dozen or more community hubs via microwave. Fasthaul is a CPRI wireless bridge that connects to the Cloud basestation. eCPRI is a packetized Ethernet “fronthaul” with reduced latency. It enables 5G base stations to be located at centralized hubs 20+ miles away. The Facebook-led Telecom Infra Project uses Clear Blue for off-grid power. An Open Network that is carrier neutral may well be managed by Facebook, Google or Amazon. Here’s the thing. Microsoft Azure, Google and Amazon Web Services, pioneered container software called Kubernetes. The basestation is software in a datacenter that can run 5G networks anywhere. Only the antenna and remote radio head are located at the container. The basestation is software in a datacenter. Mobile apps can tap super-computer power. Smartphones battled Telcos for control over app stores some 12 years ago. Telcos policed the “walled garden” on flip-phones, controlling pricing and content. With the smart phone platform, Apple and Google broke out. They freed everybody. Google extracted a 2007 pledge from Verizon in the 700 MHz C Block auction for an “open platform” that “shall not deny, limit, or restrict the ability of their customers to use the applications of their choice.” AT&T paid almost twice as much for 700 MHz spectrum in the A&B Blocks simply so they could avoid the “open platform” provisions and exert complete control over what apps were available and how much they cost. Ironically, one year later, AT&T’s iPhone became a monster hit. That happened only after AT&T seceded to Apple’s demands for control of the app store. Verizon soon followed with the Android app store. No carrier has since messed with the blueprint for the “Open Handset Alliance, now used daily in 3 billion smartphones. It’s instructive. Carriers were apoplectic over “app stores” and clueless about its potential. They nearly killed their golden goose. Community LTE, enabled by MuLTEfire, puts carriers on notice. Be competitive or die. The ability to support both mmWave and 3.5 GHz is key to ensuring full 5G coverage. Commercial carriers may also lease space on the community mast. That’s more revenue for the community-owned non-profit that manages the local hub. The FCC has approved TV White Spaces for broadband communications. The FCC says 92 percent of Americans have access to broadband, but Microsoft data indicates that it is closer to 49 percent. Microsoft believes TV white spaces are a viable solution. TV-WS vendors are include Radwin, Redline and Adaptrum. Microsoft plans to serve 3 million rural Americans in the next 3 years with their Microsoft Airband Initiative. Combining low freqency TV band, centered around channels in the 200-600 MHZ bands, along with high frequency (3.5 GHz) may deliver meaningful broadband (25 Mbps) more cost/effectively than current cellular or satellite solutions. Why isn’t it the law that every rural school in the state has a $25,000 container delivering community broadband? It would pay for itself. Wouldn’t it? You tell me, I’m not the expert here. I’m just pointing out new opportunities for sustainability and resiliency. It’s AVAILABLE NOW. A window of opportunity exists with the Federal Tax Credit and Portland’s Community Solar program. A turnkey community wireless solution might use Federated Wireless’ spectrum controller; an Ericsson, Nokia or Ruckus radio; a network mobile core from Athonet; and Amazon’s cloud IoT platform. An outdoor radio with a maximum EIRP of 50 Watts delivers high gain and good range. ExteNet, a leading provider of Neutral Host solutions, has partnered with Federated Wireless to roll out CBRS service in over 1,000 sites. Turnkey. Ready to go. Managed by a “neutral-host” third party. Open RAN modularizes cellular hardware, removing vendor lock-in. Software-defined mobile networks implement protocol-specific features in software. Together they create a telecommunications revolution that will play out over the next 5-10 years. Intel is all in. A 25kW array at $3/watt (installed) would cost about $75,000 but rebates from the Oregon Energy Trust Incentive and the Federal Tax Credit can reduce the final cost by almost 75%. Without income from an EV Charge Station it might take 10-20 years to achieve payback. Revenue from car charging/sharing may reduce payback to 3 years. Self-funded. Self-sustaining. Resiliency a side benefit. Here’s what’s inside the $25K Broadband Container. How could it make money for investors? Two ways; EV charging and community broadband. 1. EV CHARGING: We make $5 per charge and get maybe 10 charges a day ($50/day or $1500/month). A grid-connected DC Fast charger would likely be necessary. EVGo charges 60¢ per kWh, so a 20kW fillup might cost users $12, but electricity costs about 10¢ per kW/hr ($2 per 20kW). When there’s no demand for EV charging, juice is sold back to PGE. 2. COMMUNITY BROADBAND: Community broadband (at 25 Mbps) might generate $20/month per sub. Each 100-200 Mbps hub typically serves up to 50 people at $20/month. That’s $1,000/month. The containerized Charge Station/Wireless Hub might generate $2,500/month which would be close to the cost for the containers and running expenses. After the first 2 years, the $2500/mo revenue from vehicle charging and wireless broadband is mostly profit. Grants and loans help fund the initial CAPEX. The containers are easily transported state-wide. It starts small, building with success. Blokable’s Vancouver Factory might manufacture the units, perhaps integrated with coffee shops or other facilities. Stakeholders, partners, and possible funders include, PGE, Pacific Power, Bonneville Power, Energy Trust, PDX Clean Energy Initiative, Oregon Clean Power Coop, Sustainable NW, Portland Emergency Management, FEMA, FCC, DOE, DOT, PNNL, Street Trust, Hacienda CDC, Metro, Forth Mobility, Prosper Portland, Cities, Counties, State of Oregon, Education, Lyft, Uber, Neighborhood Associations, etc. Nissan has an agreement with the city of Yokosuka to provide free Leafs after an emergency to supply energy for heating, cooking, and communications. A similar agreement with Lyft or Uber could provide emergency power for Oregon communities. The IEEE 1547 Standard interconnect ensures the safety of electric power workers when working on de-energized power lines while providing local residential power from solar or batteries. One study estimated the value of V2G power between $800 to $10,800 income each year for vehicle owners. Let’s split the difference at $2,500 annually for each car. Twenty cars, then, might create $50,000 income for the Manheim Auto Auction on the West side of the island. That would be equivalent to 1 MW of battery power (50 kW/car X 20 cars) available for peak power by the utility or to supply local power after an outage. Portland’s 95 Neighborhood Associations and Oregon’s 36 counties can address digital equity while encouraging self-sufficiency. Municipal fiber can connect these nodes, enabling unlimited wireless – fixed and mobile – at even lower cost. By Q3-2019, you’ll be able to order cheap 3.5 GHz devices from Amazon. Plan on it. The Austin SHINES project integrates solar, vehicle storage and V2G smart inverters to balance power supply and demand to make power networks more resilient, efficient and cleaner. City-wide it combines 4 MW of solar with 4MW of storage with a goal of $0.14/kWh using distributed solar and storage. Could Portland achieve $0.10/kWh? Since solar generates electricity for $.03/kWh and the “battery” is a car that is expected to MAKE money, the correct answer is it GENERATES revenue. This modular “microgrid” approach demonstrates community resiliency AND profitability. V2G provides power to the grid when wind and solar can’t by shaving demand peaks during the day and re-charging from the grid at night. Studies show V2G may save consumers 15% on their electric bill. ➤ It delivers community resiliency while lowering harmful emissions. ➤ Solar-enhanced charge stations deliver revenue stream while EVs double as emergency batteries. ➤ Community Broadband Radio Service (CBRS) with satellite backhaul provides resilient broadband and additional revenue. ➤ Stimulates neighborhood economic development with local bike/car share services, food carts, etc. Try it, then scale it. How hard could it be? Silence = Dialup.